This is the newest jacket that I just completed , made in "kimono" style. The fabric came from a shop in Istanbul's Grand Bazaar that Priscilla and I visited on our trip to Turkey in 2002. It's a fairly heavy knit with lots of drape. When Beth was here for sewing earlier this week, she brought four quilts that she acquired at an antique sale that were made by Lena Mae Cooke. Mrs. Cooke was the 2nd president of the Genesee Valley Quilt Club. This twin-bed sized quilt and its mate have a Carolina Lily pattern with green swags. Neither of the quilts have dates. This quilt has appliqued tulips and a blue ribbon swag. Click on the picture to see a close-up of the quilting. It has a date of 1941 on it. Beth found a date of 1936 quilted in the corner of this scrappy basket quilt . This is a detail picture of the basket pattern in the quilt above. Today was an "open" sewing day, with everyone working on their own projects. Beth worked on aprons, a new purse pattern, and even baby hats! Jeanne Simpson is creating fabric for a vest, using some wonderful Australian prints. Linda Bachman is cutting into her stash of beautiful shibori fabrics. She made some of them last summer and bought more from Pat Pauly at last weekend's quilt show. And Priscilla created this top from some terrific handwoven ikat fabric she found in her stash. She used two of her molas to embellish the front and back. Nancy Hicks is this year's chairman for the quilt club's annual garden tour. 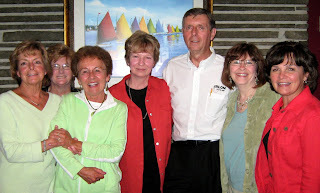 Nancy worked hard and found four gardeners willing to open their gardens to tours for interested spectators. She was our hostess and gatekeeper for one of the stops in the Fairport area. Mary Lou Dailor displays one of her beautiful pieces as part of her gracious hosting of the gardens at her house. She does wonderful hand quilting and applique. She and her husband, Jim, have several small islands and a very nice arrangement of perennials on their "hilly" backyard. A nicely-marked trail leads along a woodchip path interspersed with bench rest areas. Of course, a few quilts are added charms as one strolls the property. Blocks #5 has been juried into the Art Quilts Lowell 2009 exhibit at The Brush Art Gallery in Lowell, MA, during the month of August. It is one of the 40 pieces chosen from over 300 entries. The exhibit is part of the Lowell Quilt Festival - A Citywide Celebration of Quilts to be held August 6 - 9. 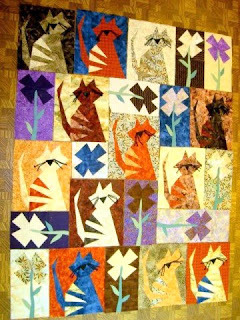 This quilt was completed in 2008 and is 62" h X 28"w.
Detail of Blocks #5: The quilting was done with Sulky 12 wt variegated thread. There were over 40 vendors offering fabric, furniture, quilting notions, and both sewing and long-arm quilting machines. Guild members donated several items for the Silent Auction. There were over 750 quilts on display, and the show drew a steady large crowd on Saturday. This year's show included wonderful options for classes and lectures by local and nationally-known teachers. Here is Janet Root getting ready to teach her class on paper piecing the blocks for "In the Garden", based on the "Midnight in the Garden" quilt used for the 2009 GVQC raffle quilt. This is Jane Sassaman's class listening to her presentation. The student wearing the blue shirt made her skirt from some of Jane's fabric -- Beautiful! These are some of Jane's samples. Jane is assisting her students as they get down to work on their own projects.